The CL1214 Ethernet Extenders are used to extend Ethernet to distances generally less than one mile. Different profiles, with symmetry or asymmetry can be selected to maximize bandwidth over various distances for various applications. Options are also provided so the copper between units can be terminated with RJ-45’s, or a terminal block, or coax connectors. Patton Electronics has refined their model numbers for greater clarity and consistency. The Patton CL1214 is the same product as the flagship Patton 2174, with a new name. The Patton CL1214E is an extended temperature, ruggedized version of the same product. If you liked Patton’s smaller, classic form factor, with only two Ethernet ports (instead of four) the Patton CL1212 Ethernet Extender Kits are what you need . 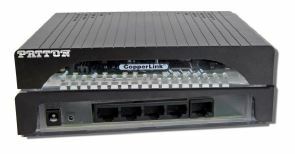 A built-in 4-port Ethernet switch makes the CopperLink Model 1214 ideal for delivering multiple IP information streams over a single cable. 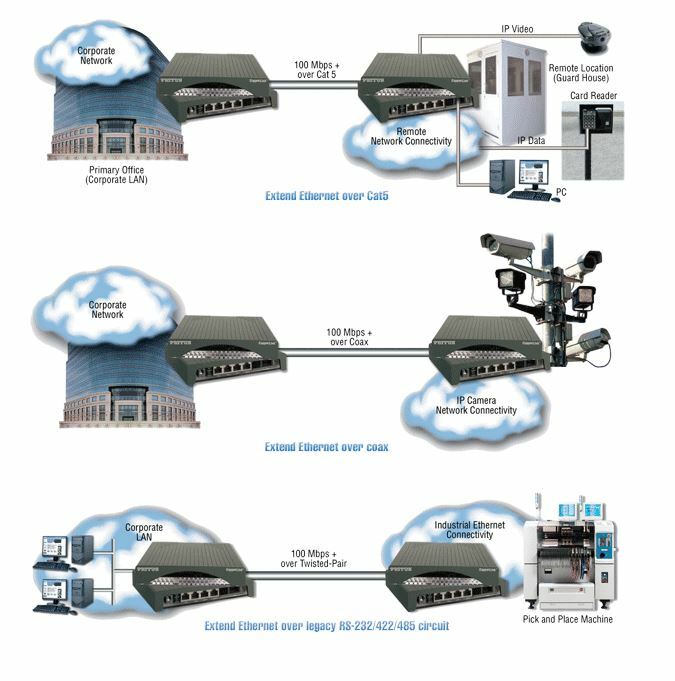 For example, at a guardhouse or security kiosk, you could aggregate IP data from a laptop, a motion sensor, and two high resolution IP video cameras for simultaneous transmission over a single Ethernet connection. Combining data flows from up to four network-enabled devices onto a single twisted pair or coax cable, the CL1214 can deliver IP traffic up to 4,250 ft (1295 m) away—well beyond the standard 328-foot (100-meter) Ethernet distance limitation. With achievable line rates up to 100 Mbps, the CopperLink 1214 eliminates the bandwidth constraints commonly experienced with other copper-based transmission technologies. The Model 1214 is engineered to re-use existing infrastructure previously employed in legacy applications including alarm circuits, E1/T1 circuits, RS-232, RS-422, RS-485, CCTV and CATV. Many newer cabling standards are also supported, including Cat 5e, Cat 6 and Cat 7. Call 610-399-3911 for more information, discount pricing, or to order.